NASA will later today admit to an embarrassing paperwork error in the 1990s that led the agency to fly two of its space shuttle orbiters with the wrong names for almost two decades. The news that space shuttle Atlantis is actually space shuttle Endeavour and the shuttle thought to be Endeavour is really Atlantis will be disclosed by NASA Administrator Charlie Bolden at a hastily called press conference. It was during this painting work in the Orbiter Processing Facility that a paperwork error led to space shuttles Atlantis and Endeavour switching identities. Photo: NASA. The error occurred in the 1990s when the then NASA Administrator Daniel S. Goldin reintroduced the space agency's 1960s-era "meatball" logo and ordered the shuttle fleet to be repainted. According to the preliminary findings of an investigation by the NASA Inspector General, the wrong work orders were sent to the Kennedy Space Center's Orbiter Processing Facility. Technicians followed the instructions to the letter, painting the new logo and the name Endeavour on Atlantis. In the neighboring hangar, Endeavour was repainted with the title Atlantis. NASA officials appeared shaken by the gravity of the error. "It was a foolish mistake and one that will not be repeated in the Orion era," a tearful Bolden told lawmakers at a closed door briefing on Capitol Hill late last week. He said the error had surfaced during a recent audit of government surplus equipment. NASA spokesman George Navias was quick to stress that the mix-up never put shuttle crew safety at risk and deferred all further questions until after the news conference. 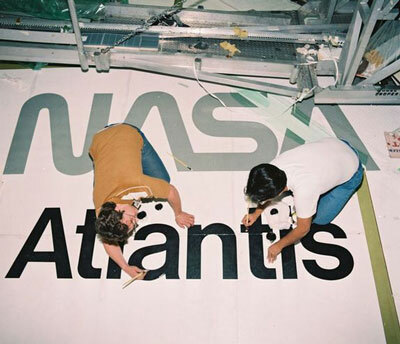 Workers paint the word Atlantis on the wrong space shuttle after an apparent paperwork snafu. Photo: Rockwell International. Curators at museums in Florida and California, were reeling after NASA officials briefed them on the mistake. At the Kennedy Space Center, where the shuttle formerly known as Atlantis went on display last year, visitor center employees were counting the cost of the mistake. "Our branding has been thrown into utter disarray," said a gift shop manager who asked not to be named. "Our attraction is prominently named Space Shuttle Atlantis. If nothing is done we'll need to remake thousands of t-shirts, mugs and keychains." At the California Science Center in Los Angeles, where the shuttle originally thought to be Endeavour is now housed, museum directors are insisting they get the orbiter they were promised. In a move reminiscent of the "failure is not option" attitude that saved the crew of Apollo 13, NASA is expected to unveil a multi-million dollar plan to put things right. In Houston, the Boeing 747 shuttle carrier aircraft was being disassembled to be transported to a museum itself, but now the space agency has ordered engineers to put the aircraft back together so it can fly the misnamed shuttles to their rightful homes. The goal is to complete the operation before next April 1.